Foals are captured then trailered off and put into pens with other orphan foals. All photos by Steve Paige. 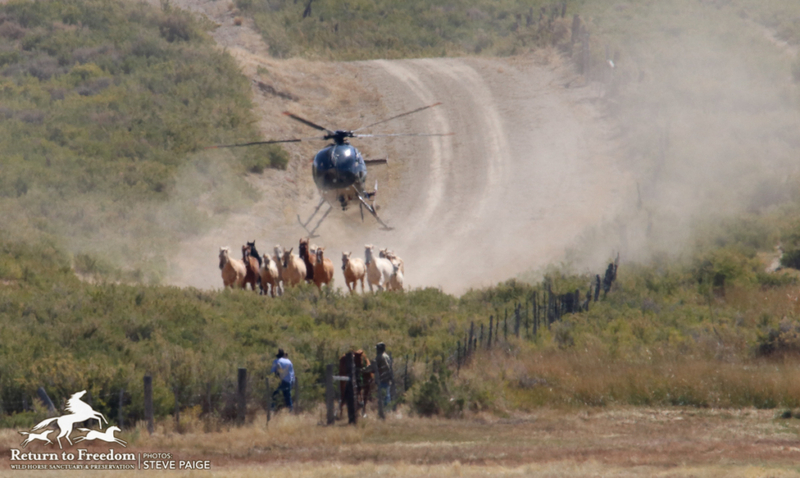 The Bureau of Land Management on Wednesday captured and removed 32 mares and 19 studs from private land. 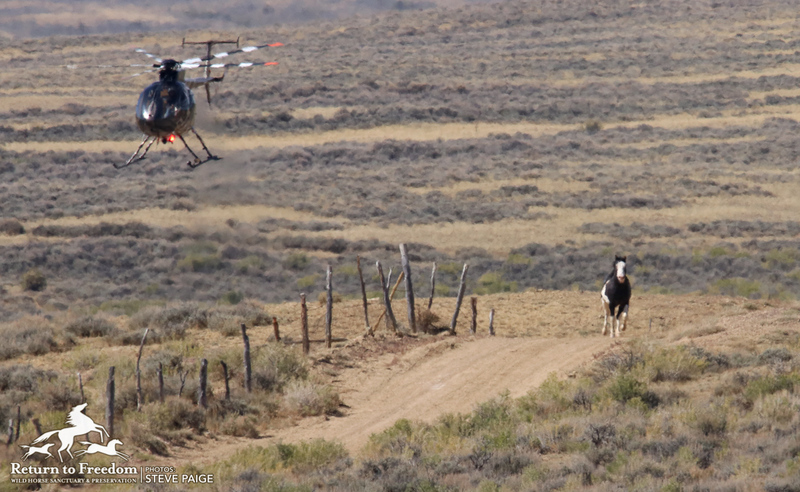 That brings to 161 the number of adult wild horses captured through three days as part of the the Salt Wells Creek / Great Divide Basin / Adobe Town heard management areas roundup in southwest Wyoming’s Checkerboard region. 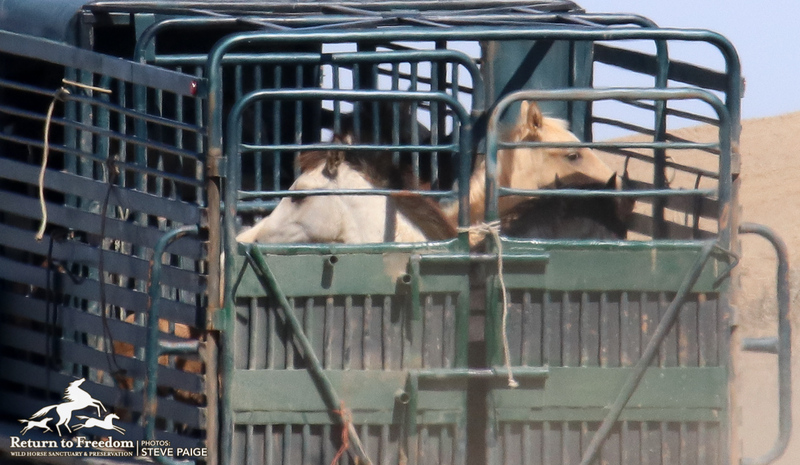 Four wild horses have been euthanized. Also captured on Wednesday: 20 foals and weanlings. 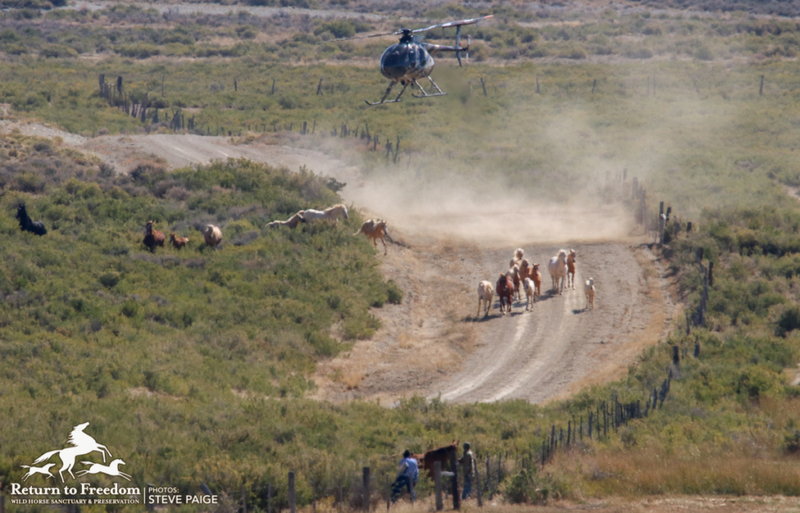 In an unusual move, BLM is not counting horses that it removed under 1 year old toward its goal of taking 1,560 wild horses from their home ranges on the Salt Wells, Adobe Town and Great Divide Basin Herd Management Areas. Though not typical of recent BLM roundups, the target of 1,560 “adult” horses is mentioned in the agency’s Environmental Assessment. 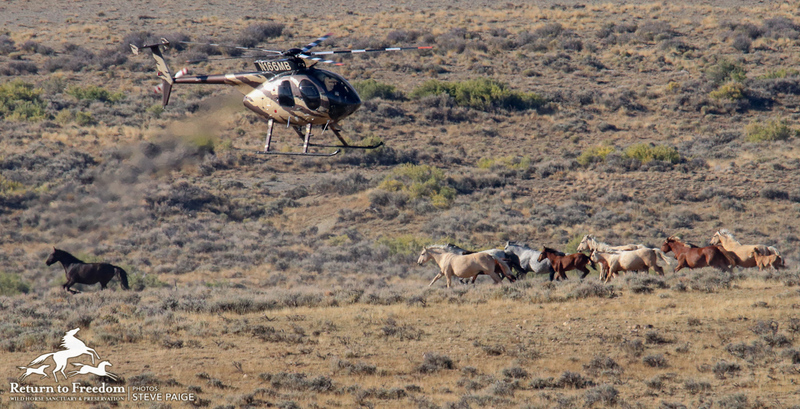 On Wednesday, having received requests for more information from RTF and others, the agency acknowledged that during the first two days of helicopter drive trapping, contractors also captured 22 foals and weanlings–bringing that separate total to 44 through three days. and a six year old palomino mare with severe arthritis in the left front knee. Foals, like the one trailing behind its fleeing family here, are not being counted against BLM’s goal of 1,560 wild horses captured. 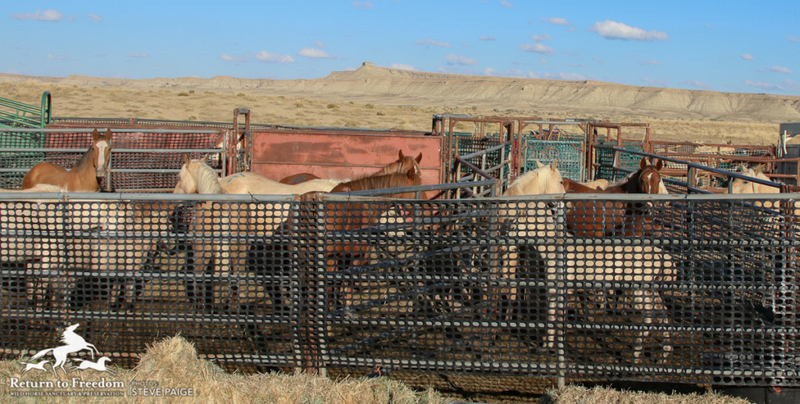 Above and below: Wild horses being pushed into the trap alongside a fence line. A beautiful lone pinto was captured after he was singularly chased down. Three very young foals got to be paired up to their mares in temp holding. A previously collard mare was among those captured. 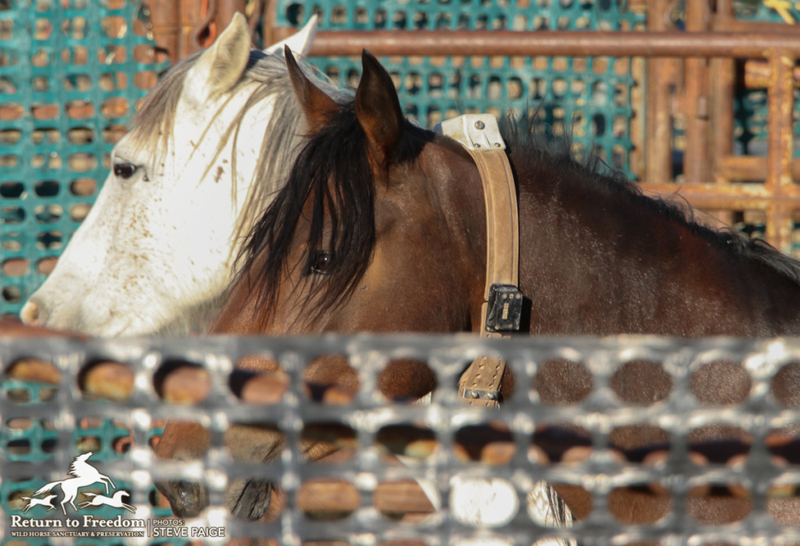 The collared mares will be released at some point, as a movement study being conducted by BLM and the University of Wyoming continues.